We are proud to present premium quality Glass Funnel that are made from extra ordinary Borosilicate glass that offers durable and long lasting structure to them. The supreme funnels, manufactured by us, are praised by our clients for neat and clear calibrations. 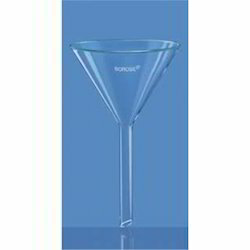 The superior Glass funnels, offered by us, come in several sizes for easy recognition. “Teknik Separating Funnels, with PTFE Key, Stopcock & Polythelene stopper, Pear shape. Manufactured from ASTM E 438 TYPE 1 CLASS A BORO 3.3 GLASS. Glassco Laboratory Equipments Pvt. Ltd. These Funnels Long Stem have smooth walls, 600 cone angle and external ribs to prevent air lock. 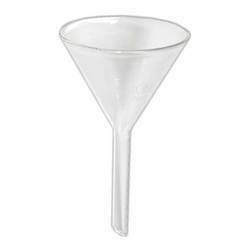 Molded in polypropylene, these clear funnels can also be steam autoclaved. We are a Leading Manufacturer & Exporter of Funnels Glass, which are used to pour chemicals from one vessel glass to other. These funnels are of different capacity and dimensions. These are made from quality plastics and can be used for various purposes. Our products are available in the market at leading rates.